The 970A-UD3P motherboard is designed to offer a stable, high-speed platform for delivering amazingly fast data transfer via the GIGABYTE 333 onboard acceleration technologies. Featuring the USB3.0 controller, AMD 900 series motherboards allow users to take advantage of super fast USB transfer rates of up to 5Gbps, delivering 10x faster data transfer compared to USB 2.0. Utilizing the industry's first Serial ATA Revision 3.0 solution via AMD SB950 chipset, GIGABYTE AMD 900 series motherboards offer native 6 ports of next generation high speed data storage devices support with data transfer speeds of up to 6 Gbps with RAID 0, 1, 5, 10. 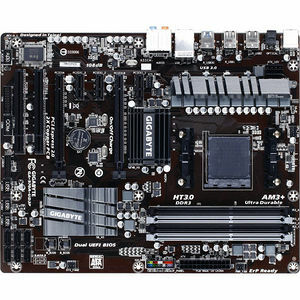 The AMD 900 series motherboards introduce a unique hardware design with lower resistance fuses for ensuring lower voltage drops and providing more stable and plentiful power delivery. USB ports also benefit from a 3x power boost for better power delivery to power hungry USB devices.